Page Street Publishing, 9781624146459, 192pp. 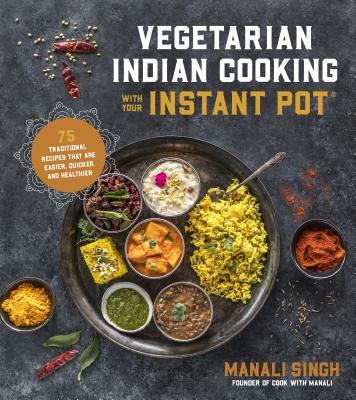 Manali Singh, founder of the popular blog Cook with Manali, shares her secrets to making your favorite traditional Indian dishes faster and healthier in your Instant Pot® or other multifunction cooker. And the majority of her wonderfully spiced recipes are also vegan— or can be easily made vegan—so it’s perfect for specific diets or anyone who wants to include more plant-based meals in the weekly rotation. Enjoy classics like Matar Paneer and Chana Masala, as well as traditional street foods like Pav Bhaji, a medley of spicy mashed veggies eaten with dinner rolls, and Vegetarian Momos—healthy dumplings steamed to perfection. And don’t forget dessert! Indulge in Chai Crème Brulee or Kalakand, spiced Indian milk fudge. Whether you’re new to the Instant Pot® or it’s a staple in your kitchen, Manali’s 75 recipes will show you how to easily prepare and enjoy authentic favors of Indian cuisine in your own kitchen. Manali Singh is the founder of the blog Cook with Manali. She was born and raised in India, but moved to the United States in 2011. She currently lives in Seattle, WA.